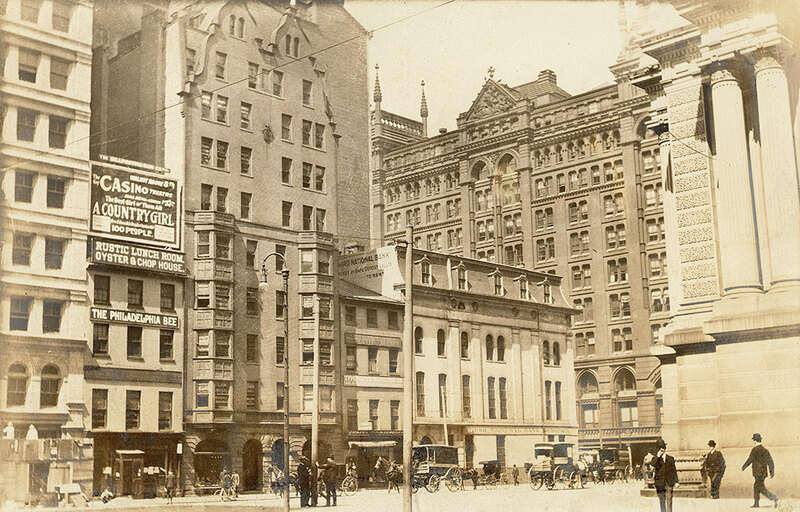 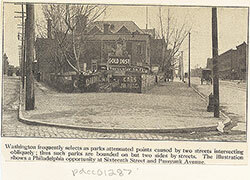 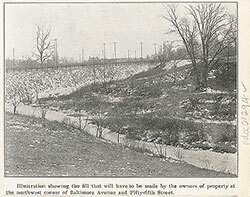 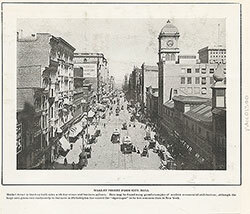 Notes: "By the turn of the century business had moved uptown and was clustering around City Hall, which is on the extreme right in this photo. 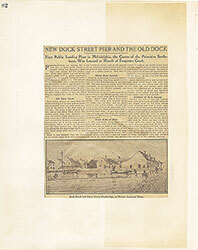 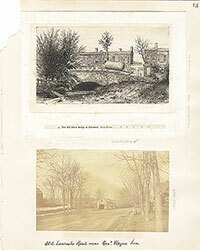 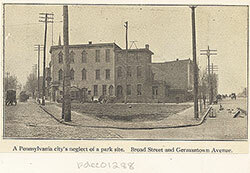 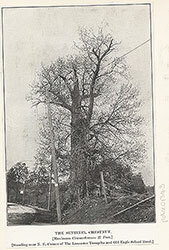 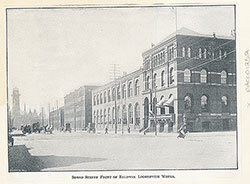 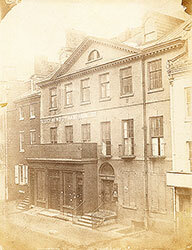 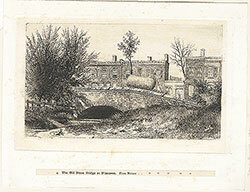 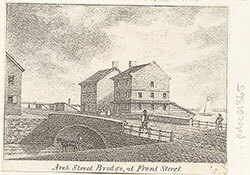 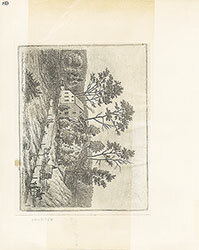 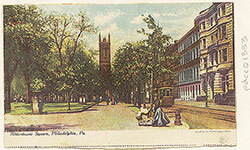 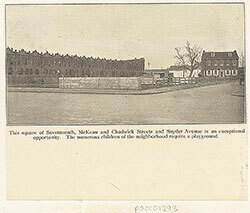 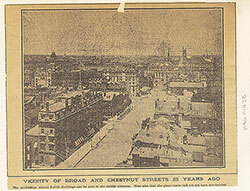 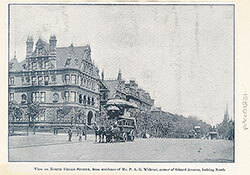 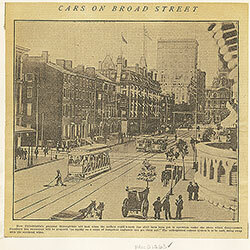 Next to it in the background is Broad Street Station. 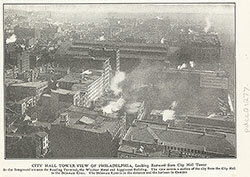 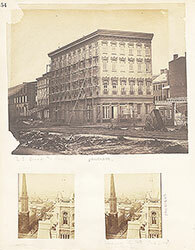 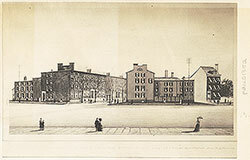 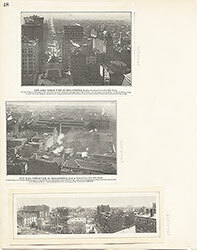 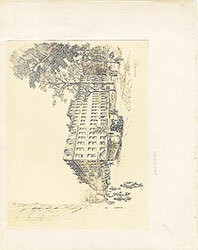 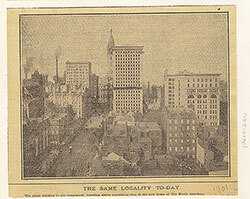 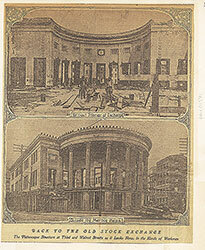 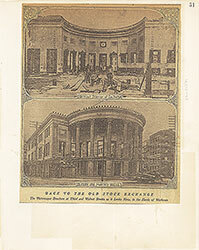 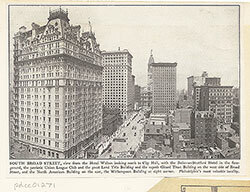 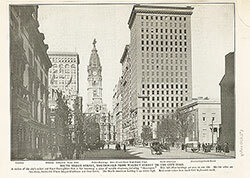 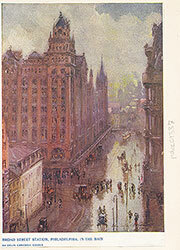 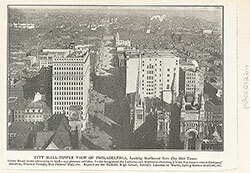 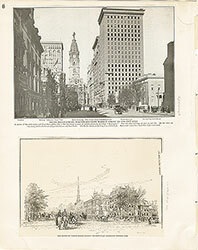 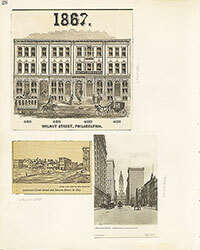 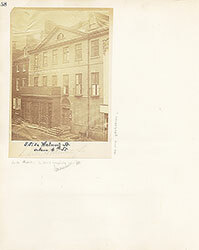 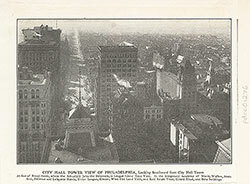 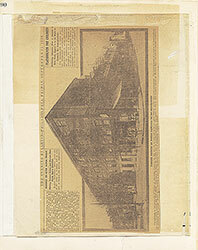 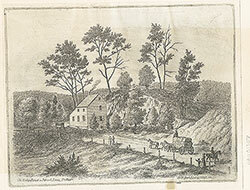 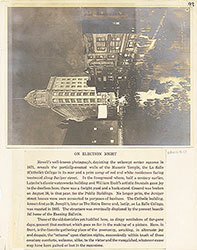 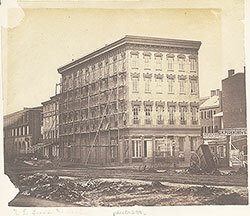 In the center foreground is the Third National Bank and an office building." 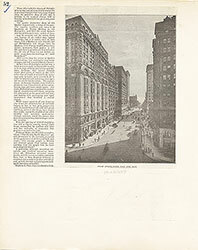 --OPEP, p. 165. 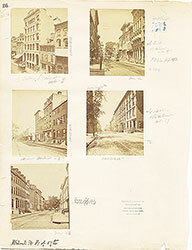 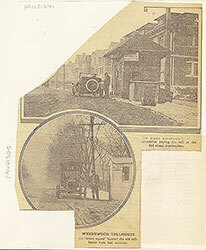 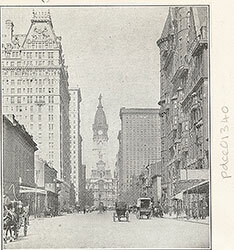 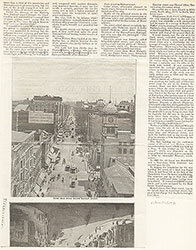 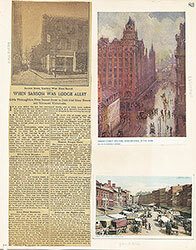 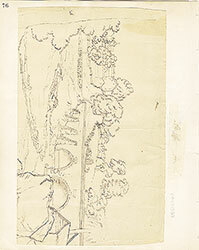 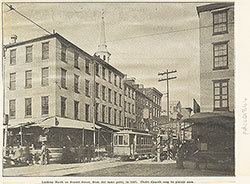 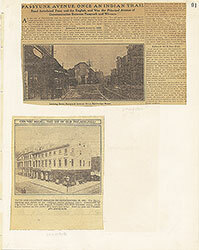 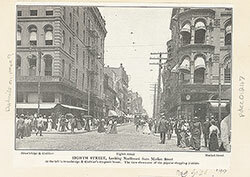 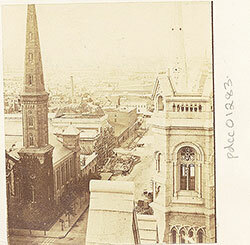 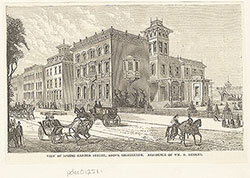 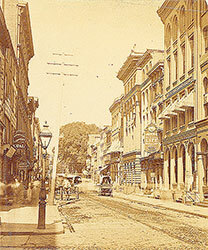 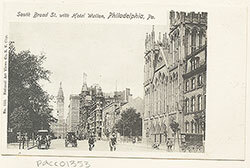 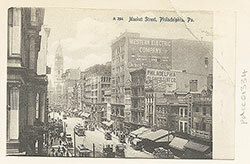 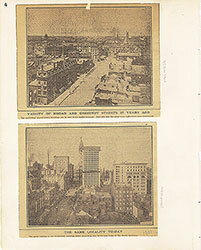 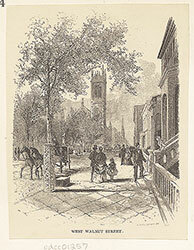 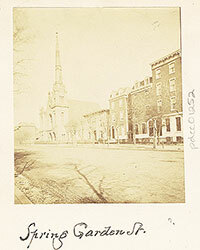 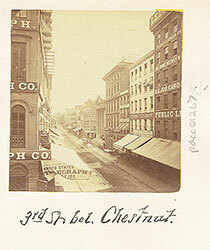 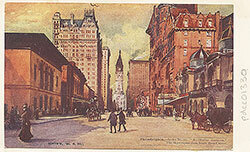 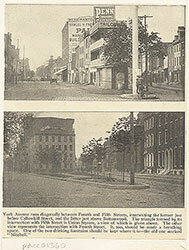 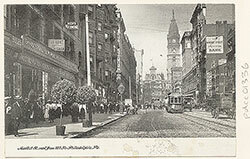 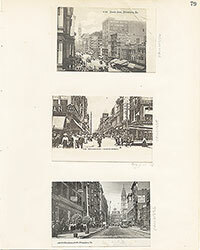 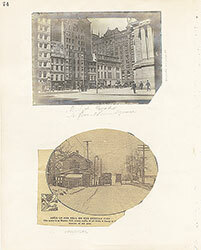 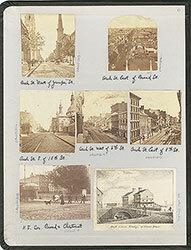 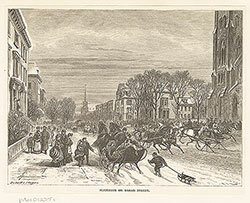 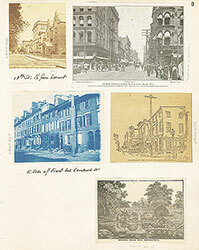 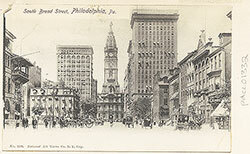 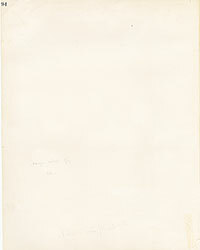 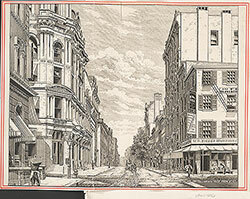 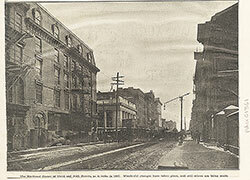 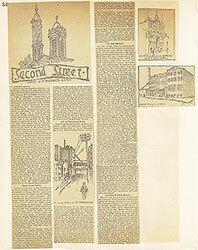 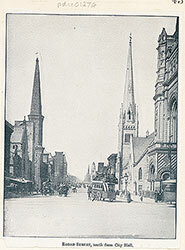 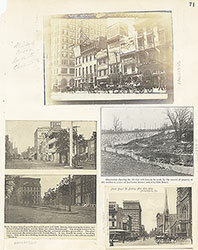 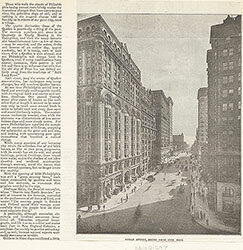 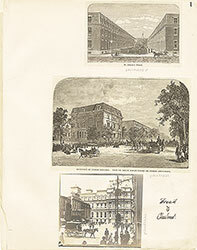 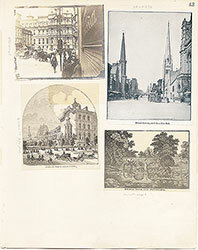 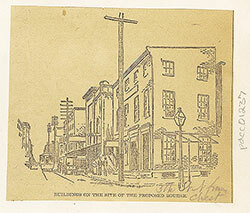 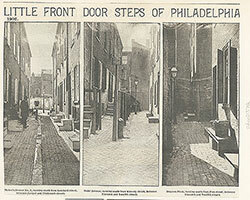 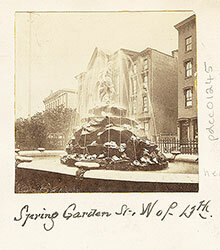 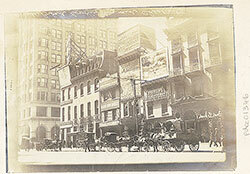 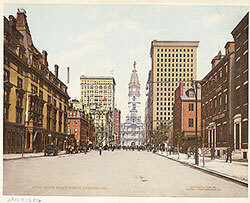 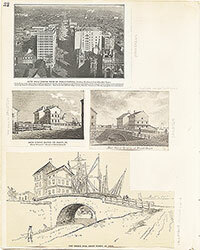 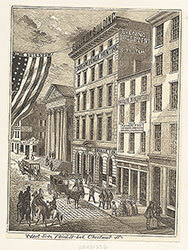 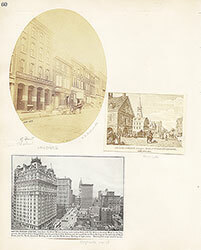 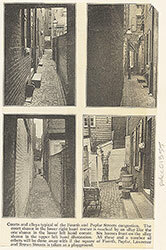 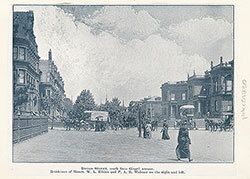 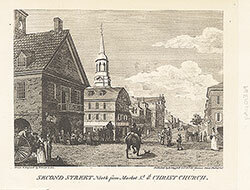 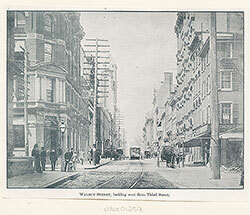 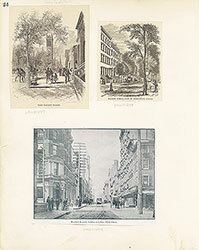 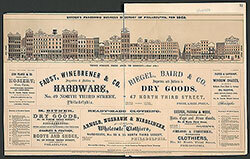 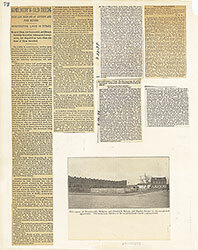 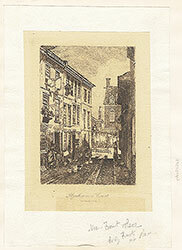 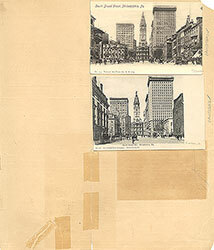 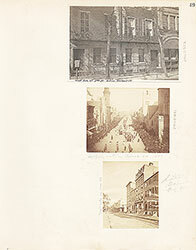 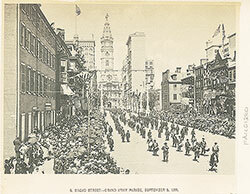 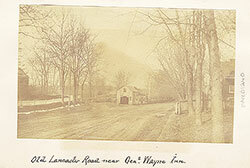 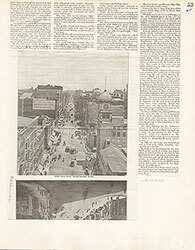 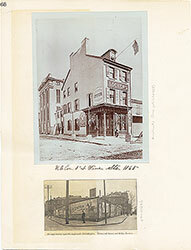 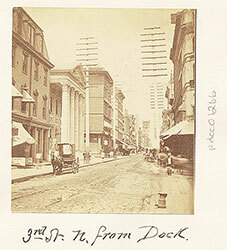 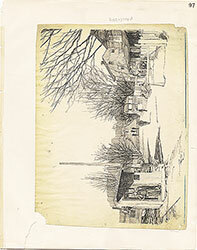 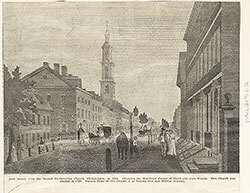 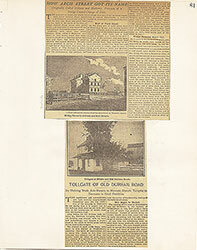 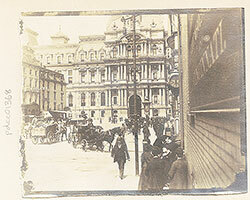 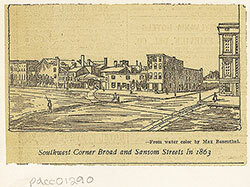 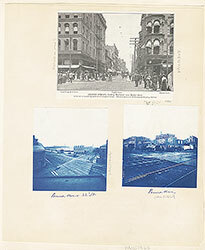 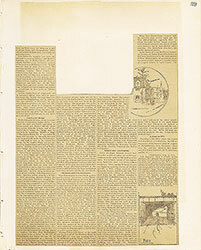 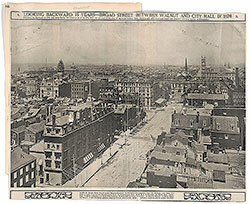 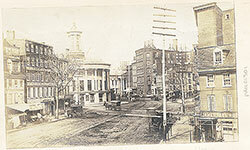 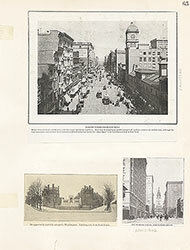 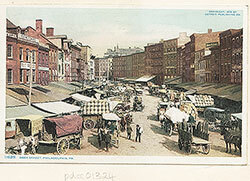 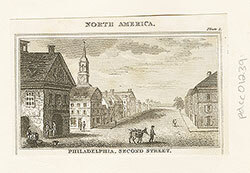 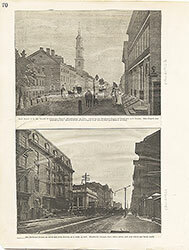 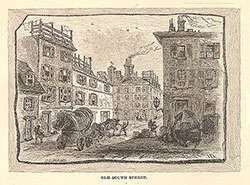 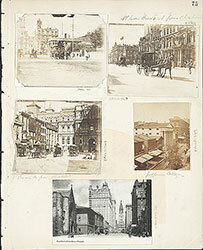 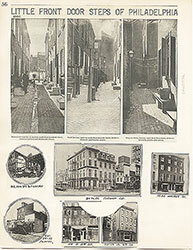 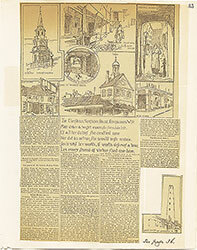 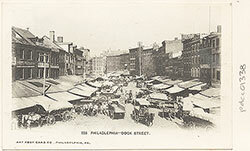 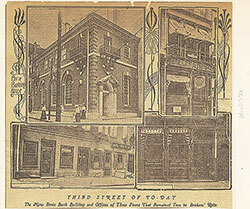 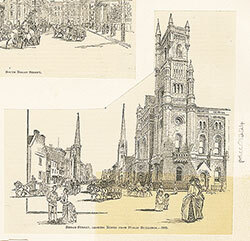 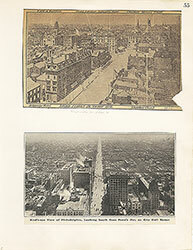 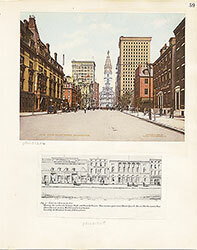 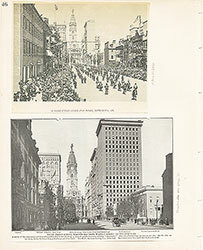 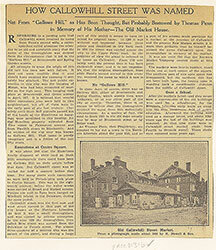 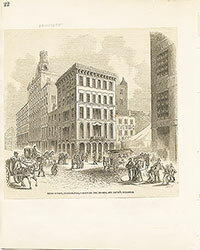 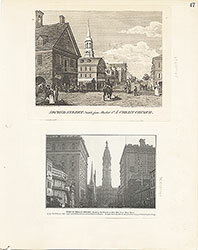 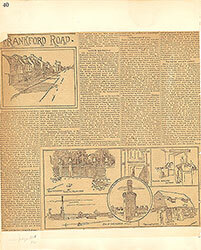 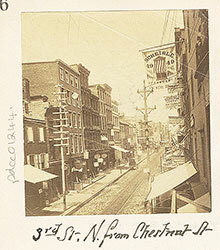 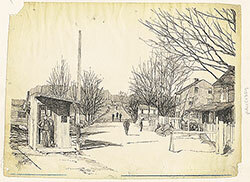 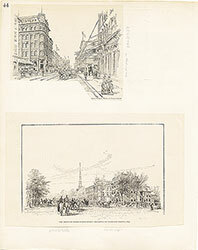 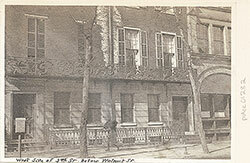 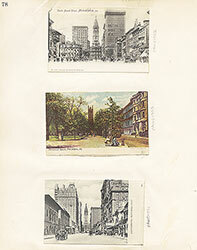 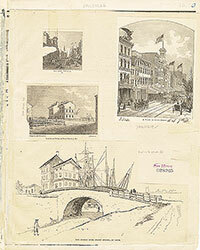 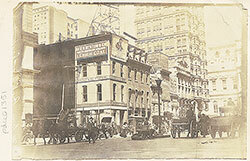 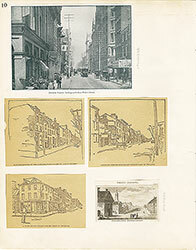 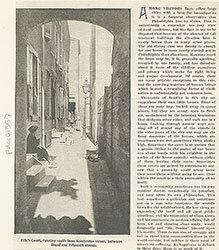 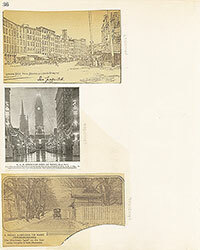 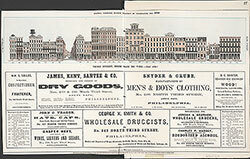 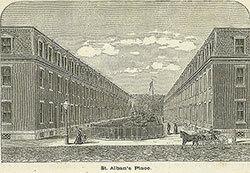 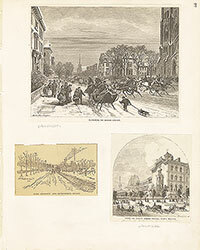 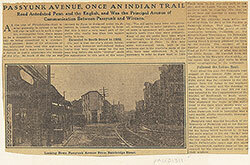 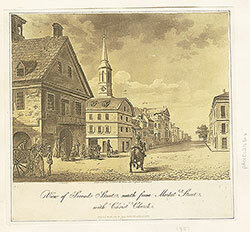 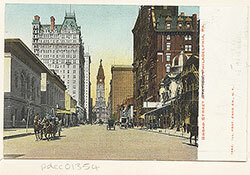 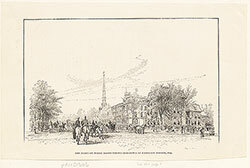 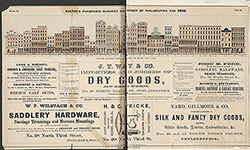 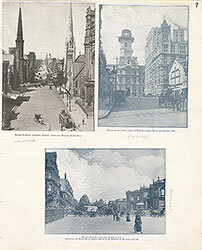 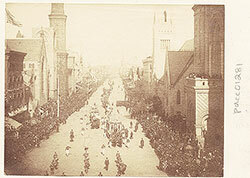 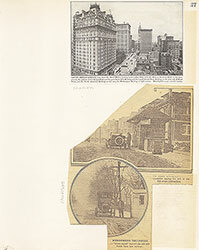 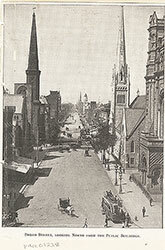 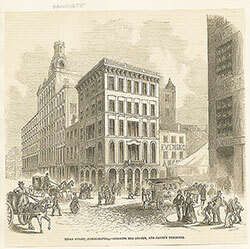 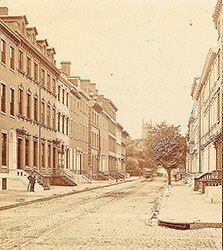 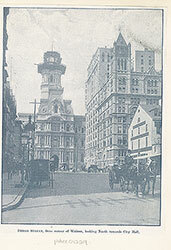 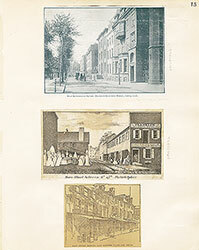 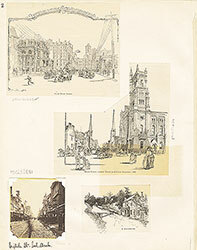 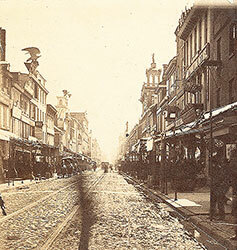 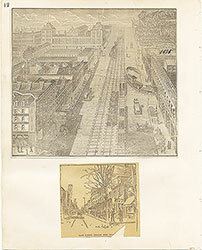 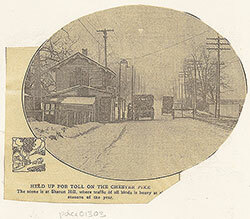 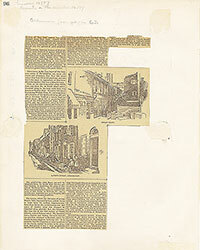 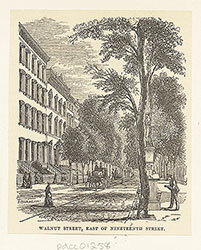 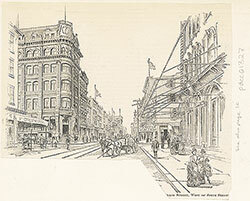 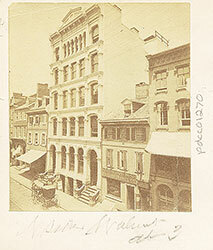 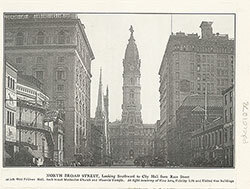 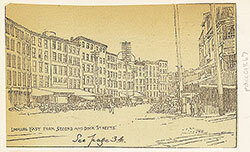 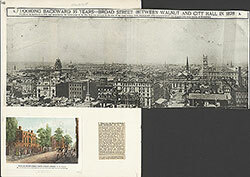 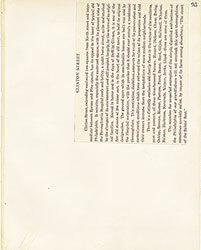 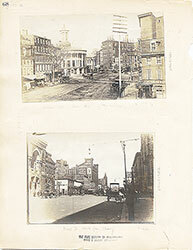 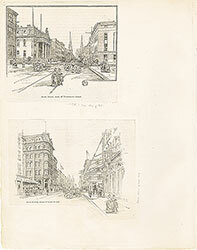 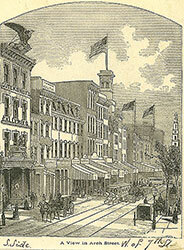 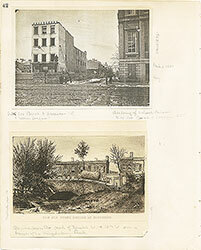 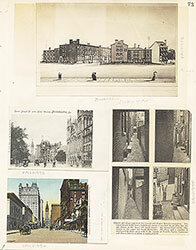 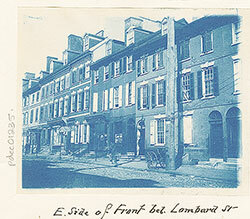 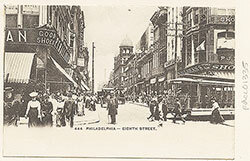 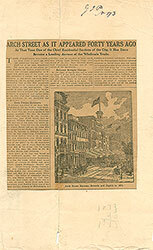 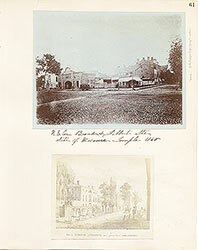 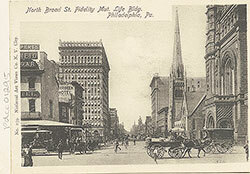 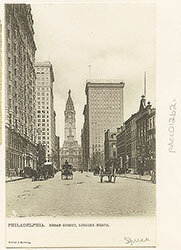 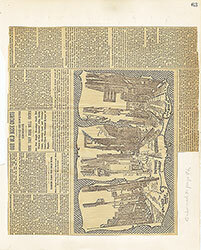 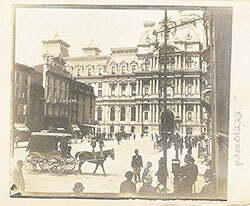 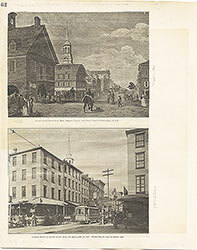 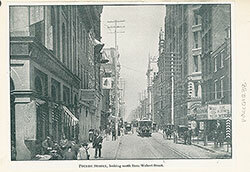 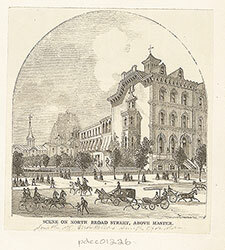 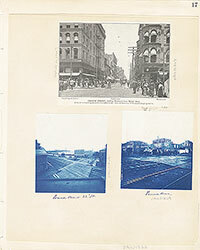 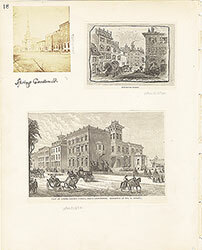 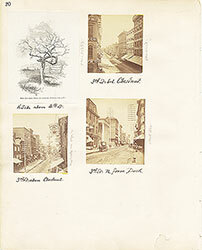 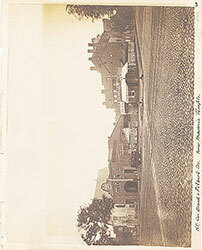 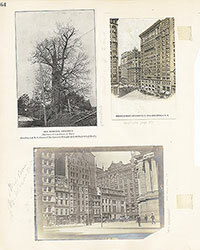 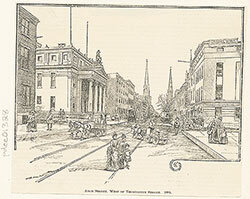 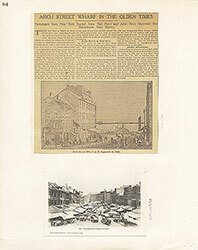 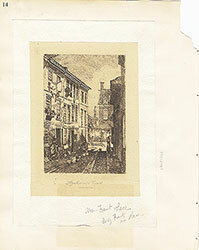 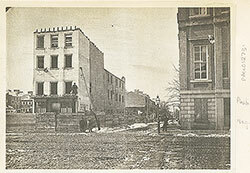 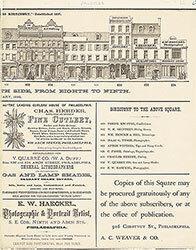 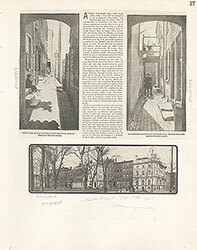 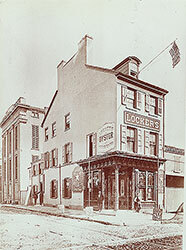 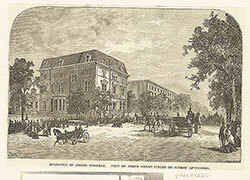 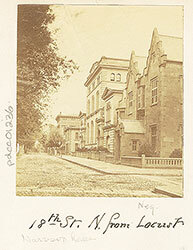 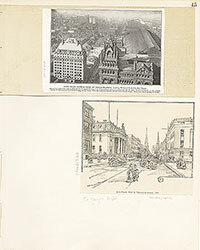 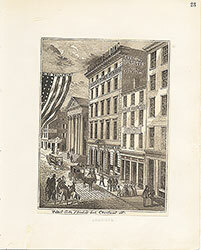 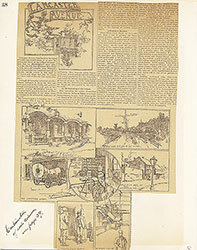 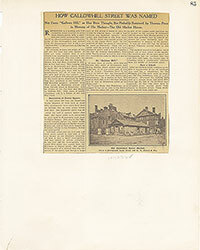 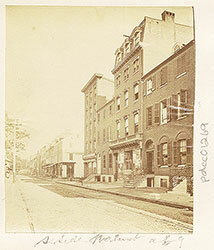 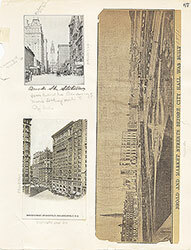 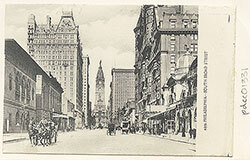 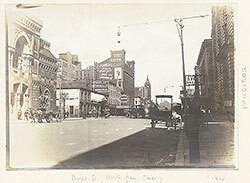 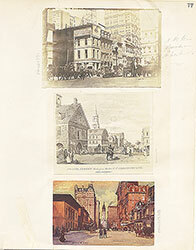 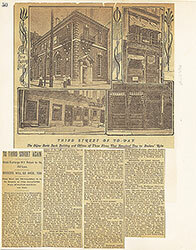 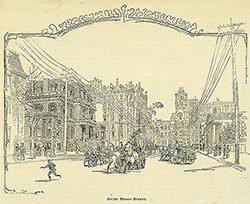 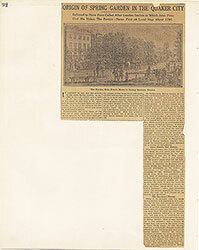 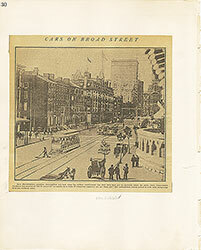 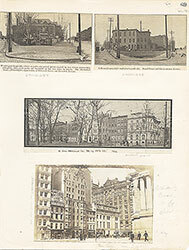 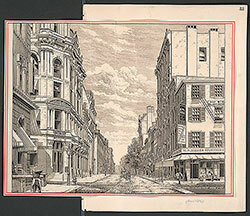 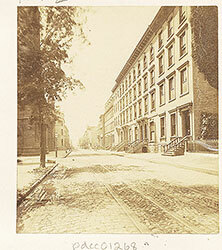 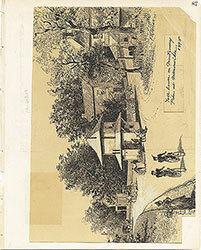 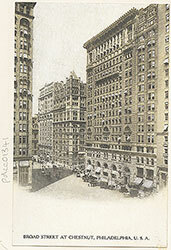 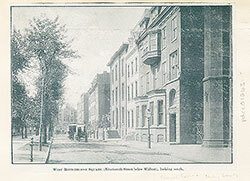 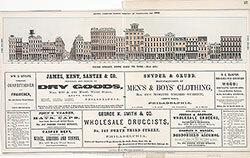 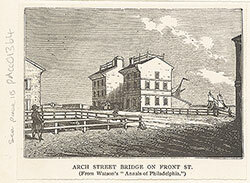 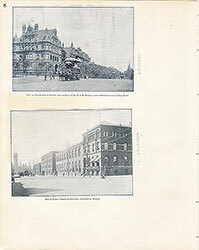 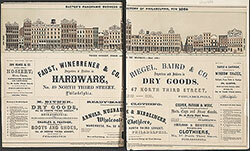 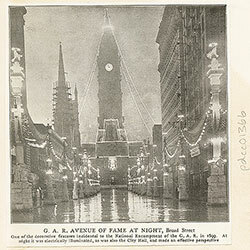 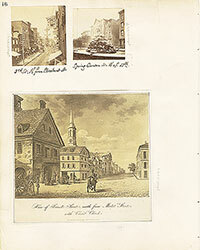 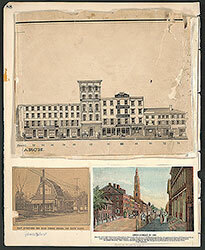 Notes: The street, with commercial buildings; men walking on sidewalks; horse and carriages on street. 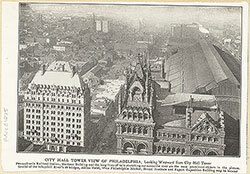 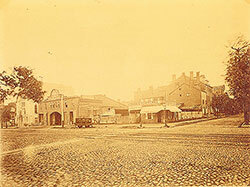 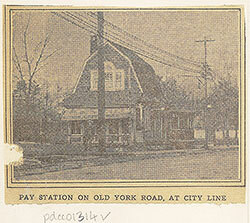 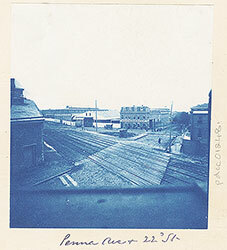 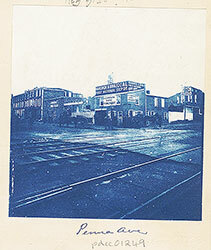 Railroad station in background and partial view of City Hall on right. 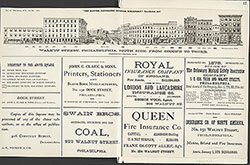 Businesses include: "The Billposting Sign Co. 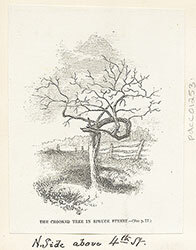 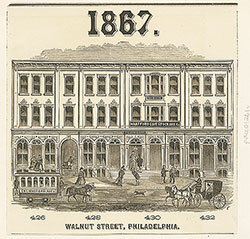 Phila.," "Walnut above 8th, The [Gay?] 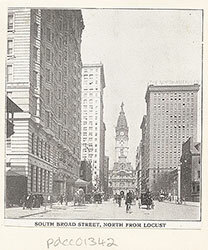 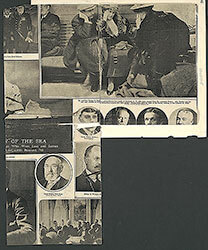 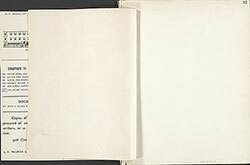 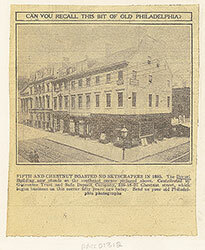 Casino Theater, the best girl of them all, A country girl...100 people," "Rustic Lunch Room, oyster & chop house, The Philadelphia Bee," "Charles L. Jones Detective Agency," "Typewriter Inspection Co.," "Sharpless & Braddock," and "Third National Bank, boxes in safe-deposit vaults -- to rent."